Married Name 19 October 1946 As of 19 October 1946,her married name was Marklein. Rita M. Schmitz was born on 5 September 1921 at Wisconsin. Rita M. Schmitz married Robert I. Marklein, son of Irvin Francis Marklein and Susan A. McPhillips, on 19 October 1946. Rita M. Schmitz died on 22 March 2017 at age 95 Rita M. Marklein age 95 of Spring Green peacefully passed away on Wednesday, March 22, 2017 with her three girls by her side. She was born on September 5, 1921 the daughter of Peter and Anna (Bissen) Schmitz in Bear Valley, WI. She was married on October 19, 1946 to Bob Marklein and was a member of St. John’s Catholic Church in Spring Green. Rita’s personality set her apart. You only had to meet her for a short while to feel her genuine kindness, warmth and humor. She had a way of making you feel like you were the most important person in the room. She was a wonderful mom and grandma and made each of us feel that we were “her favorite”. She held many jobs in the Spring Green area but by far her favorite was working at the Bank of Spring Green where she developed many strong friendships that continued after her retirement. In her 95 years she touched many lives- she truly had a wonderful life. Survivors include her 3 daughters, Joyce Loomis of Waunakee, Ann (Tom) Sippy of Madison, Renee (Joe) Dolan of Sparta, 7 grandchildren, Meeghan (John), Mark, Greg, Paul (Jessica), Jeff, Laura (Andrew), Karen, a granddaughter-in-law, Stacy, 2 great grandchildren, Chloe and Selah, 2 brothers, Joe (Catherine) Schmitz, Erwin (Lindy) Schmitz both of Bear Valley, nieces, nephews, her very special in-laws, other relatives and friends. She was preceded in death by her parents, her husband, son-in-law, Bob Loomis, a grandson, Wade Loomis, 4 sisters, Eva Schmitz, Zita Nachreiner, Gert Bindl, Anne Ring, 3 brothers, Gregor, Leonard and Francis Schmitz. A special thank you to Bucky and Arlene Peterson for their daily visits, friendship and unending support. She called them her angels, and indeed they were. A Mass of Christian Burial will be held on Wednesday, March 29, 2017 at 11:00 A.M. at St. John’s Catholic Church in Spring Green. Fr. John Silva will officiate with burial in the church cemetery. Visitation will be held on Tuesday, March 28, 2017 at St. John’s Catholic Church from 4:00 P.M.-7:00 P.M. and again on Wednesday at the church from 10:00 A.M. until the time of Mass. In lieu of flowers memorials may be made to St. John’s Catholic Church or school, or to St. Killian’s Cemetery Association. The Richardson-Stafford Funeral home is assisting the family with the arrangements. Name Variation Robert I. Marklein was also known as Bobby. Name Variation Robert I. Marklein was also known as Bob. Robert I. Marklein was born on 27 July 1920 at Wisconsin. Robert I. Marklein married Rita M. Schmitz, daughter of Peter A. Schmitz and Anna Margaret Bissen, on 19 October 1946. Robert I. Marklein died on 9 July 1970 at age 49. Name Variation Anne M. Schmitz was also known as Anna. Name Variation Anne M. Schmitz was also known as Annie. Married Name August 1947 As of August 1947,her married name was Ring. Anne M. Schmitz was born on 20 July 1926 at Wisconsin. Anne M. Schmitz married Cletus R. Ring, son of Raymond Ring and Emma Theresa Blau, in August 1947. Anne M. Schmitz died on 16 November 2015 at age 89 Anna “Anne” M. Ring age 89, of Plain, took her last breath on earth and her first breath in heaven at 8:55 A.M. on November 16, 2015. She died like she had always prayed for, peacefully, surrounded by her children and several grandchildren. Anne always said she never did anything exceptional in the eyes of the world like building skyscrapers or curing cancer, but she found great joy in what she did do well, raising her 7 children, all of whom meant the world to her. Anne worked for many years as a nursing assistant at Sauk County Healthcare Center and Greenway Manor which was her home during her final years. She was also a part-time librarian at the Plain Library. She will always be remembered for her “momizms” and always having a smile on her face and a rosary in her hand, purse and bedside. She leaves behind the love of her life, Cletus Ring, her children, Steve (Nancy) Ring, June (Charles) Drott both of Scottsdale, AZ, Gail (Tim) Bryne of Middleton, Betty (John) Kraemer of Paradise Valley, AZ, Karen (John) Heinz of Scottsdale, AZ, Mike (Nancy) Ring of Plain, Jim (Peggy) Ring of Spring Green, 16 grandchildren, 5 great grandchildren, a sister, Rita Marklein of Spring Green, 2 brothers, Erwin (Lindy) Schmitz and Joe (Catherine) Schmitz both of Bear Valley, nieces, nephews, other relatives and friends. She was preceded in death by her parents, Peter and Anna Schmitz, 3 brothers, Leonard, Gregor and Francis, 3 sisters, Eva Schmitz, Zita Nachreiner and Gertrude Bindl. A Mass of Christian Burial will be held on Thursday, November 19, 2015 at St. Luke’s Catholic Church in Plain at 12:00 Noon. Fr. Mike Resop will officiate with burial in the church cemetery. Visitation will be held on Thursday at the church from 10:00 A.M. until the time of Mass. In lieu of flowers Anne requested that memorials be made to the maintenance fund of St. Ann’s Shrine, St. Lukes Catholic Church, Greenway Manor Nursing Home or the Diabetes Association. The family would like to give special thanks to the staff at Greenway Manor. All the family will be forever grateful for all your love and care given to our mother. “ Death leaves a heartache no one can heal, love leaves a memory no one can steal.” “ Because of our mother, we will never be the same.” Online condolences available at www.staffordfuneralhomes.com. The Richardson-Stafford Funeral Home is assisting the family with the arrangements. Name Variation Cletus R. Ring was also known as Clete. Cletus R. Ring was born on 15 February 1926 at Wisconsin. He was the son of Raymond Ring and Emma Theresa Blau. Cletus R. Ring married Anne M. Schmitz, daughter of Peter A. Schmitz and Anna Margaret Bissen, in August 1947. Cletus R. Ring died on 3 February 2017 at age 90 Cletus R. Ring “Clete” left this world a better place than he found it on February 3, 2017. Just shy of his 91st birthday, he was born February 15, 1926, in Plain to Raymond and Emma (Blau) Ring. Clete enlisted in the US Navy during World War II at the age of 17. He served on board the USS Gambier Bay CVE73, serving as a motor machinist in the engine room. On October 25, 1944, during the Battle of Leyte Gulf, his ship was sunk by enemy gunfire. Wounded badly, Clete survived 2 days in shark infested waters, clinging to a life raft. He was subsequently awarded the Purple Heart. Returning to Plain after the war, Clete married Anna M. Schmitz in August of 1947. Subsequently he built and ran the Skelly Service Station in Plain for over 20 years. He also was a member of the United Steamfitters Local 601. Following retirement Clete could most often be found at his sons’ business, RingBrothers, where he would keep staff and visitors regaled with his stories and advice to all, (and on all subjects). Clete is survived by what he undoubtedly would say is his greatest legacy, his 7 children: Steve (Nancy) Ring of Scottsdale, AZ, June (Charlie) Drott of Scottsdale, AZ, Gail Byrne of Madison (Tim Byrne of Middleton), Betty (John) Kraemer of Paradise Valley AZ, Karen (John) Heinz of Scottsdale AZ, Mike (Nancy) Ring of Plain and Jim (Peggy) Ring of Spring Green, 16 grandchildren, 5 great-grandchildren, 6 sisters Caroline Weiss, Elvy Weiss, Bernice Weber, Alice Swinehart, Charlotte Dischler, Audray Gerber and a brother John (Jack) Ring. He was preceded in death by former wife Anna M. Ring, a special friend Kathy Kohler, his parents Raymond and Emma Ring and a brother Delmar Ring. A Mass of Christian Burial will be held on Thursday, February 9, 2017 at 11:30 AM at St. Luke’s Catholic Church in Plain. Father John Silva will officiate with burial in the church cemetery where military graveside rites will be conducted by the Plain American Legion Post #398. Visitation will be held on Thursday at the church from 9:30 A.M. until the time of the Mass. In lieu of flowers Clete requested that memorials be sent to the USS Gambier Bay Association or St Luke’s Catholic Church. The family would like to give special thanks to Father John, the staff at Greenway Terrace and to all those who assisted the family at Greenway Manor. The Richardson-Stafford Funeral Home is assisting the family with the arrangements. Name Variation Gregor J. Schmitz was also known as Gregory. Gregor J. Schmitz was born on 30 August 1913 at Wisconsin. He was the son of Peter A. Schmitz and Anna Margaret Bissen. Gregor J. Schmitz died on 22 August 1921 at age 7. Leonard Nicholas Schmitz was born on 3 March 1920. Leonard Nicholas Schmitz died on 14 April 1921 at age 1. Francis P. Schmitz was born on 31 October 1922 at Wisconsin. Francis P. Schmitz married Florence E. Marklein, daughter of Herman G. Marklein and Erna L. Willey, on 12 October 1948. Francis P. Schmitz died on 30 November 2003 at age 81 Francis P. Schmitz, age 81, of Richland Center, and formerly of Bear Valley, passed away on Sunday, Nov. 30, 2003, at Meriter Park Hospital in Madison, while surrounded by his wife of 55 years, Florence and his family. He was born on Oct. 31, 1922, in Bear Valley, the son of Peter and Anna (Bissen) Schmitz. Francis was married on Oct. 12, 1948, to the former Florence Marklein. He was a member of St. Mary's Catholic Church in Richland Center. Francis was a fire warden for more than 25 years and operated the Schmitz Cheese Factory and farm with his two brothers, starting when he was 14 years old, and retiring when he was 65 years old. Upon his retirement, he loved to do woodworking and was generous with his creative talent. Survivors include his wife, Florence Schmitz of Richland Center; five children, Gerry (Alice) Schmitz of Hawthorn Woods, Ill., Kathy (Wayne) Morgenthaler of Richland Center, Peter (Cindy) Schmitz of Sun Prairie, Tom (April) Schmitz of Spring Green, and Dale (Mary) Schmitz of Naperville, Ill; 10 grandchildren; five siblings, Gertrude Bindl of Plain, Joe (Catherine) Schmitz of Bear Valley, Erwin (Lindy) Schmitz of Bear Valley, Rita Marklein of Spring Green, and Annie Ring of Plain; nieces; nephews; other relatives; and friends. He was preceded in death by his parents, Peter and Anna Schmitz; two brothers, Leonard and Gregor; and two sisters, Zita Nachreiner and Eva Schmitz. A Mass of Christian Burial will be held on Wednesday, Dec. 3, 2003, at 10:30 a.m. at ST. MARY'S CATHOLIC CHURCH in Richland Center. Father Emmanuel Famiyeh will officiate with burial in the St. Kilian's Catholic Cemetery in Bear Valley. Visitation will be held on Tuesday, Dec. 2, 2003, at the STAFFORD FUNERAL HOME in Richland Center from 4 p.m. to 8 p.m., where a scripture service will be held at 4 p.m. Visitation will also be held on Wednesday at the church from 9:30 a.m. until the time of the service. The Stafford Funeral Home is assisting the family with arrangements. Francis P. Schmitz obtained US Social Security Card at Wisconsin; last residence Richland Center, Richland, Wisconsin. Eva Gertrude Schmitz was born on 16 March 1915 at Wisconsin. Eva Gertrude Schmitz died on 22 December 1942 at age 27. Name Variation Zita F. Schmitz was also known as Zeith. Name Variation Zita F. Schmitz was also known as Zita E.
Married Name Her married name was Nachreiner. Zita F. Schmitz married Harold R. Nachreiner, son of Rudolph Simon Nachreiner and Rosella Heiser. Zita F. Schmitz was born in 1918 at Wisconsin. Zita F. Schmitz died on 2 April 1963. Joseph Schmitz was born on 31 May 1850 at Wisconsin. He was the son of Peter Schmitz and Cecila Goeker. Joseph Schmitz married Gertrude Ann Dederich, daughter of Anton D. Dederich and Anna Mary Schaefer, on 25 November 1878. Joseph Schmitz died on 20 October 1927 at age 77. [S243] U.S. Federal Census 1920 U.S. Federal Census, by Ancestry.com, ED201. Dwelling 189. Regina Schmitz was born circa 1899 at Wisconsin. She was the daughter of Joseph Schmitz and Gertrude Ann Dederich. (?) Schmitz died on 15 March 1925. He was born on 15 March 1925. Nicholas Bissen married Eva Weires. Married Name Her married name was Bissen. Eva Weires married Nicholas Bissen. Married Name 12 October 1948 As of 12 October 1948,her married name was Schmitz. Florence E. Marklein was born on 23 June 1928 at Wisconsin. Florence E. Marklein married Francis P. Schmitz, son of Peter A. Schmitz and Anna Margaret Bissen, on 12 October 1948. Florence E. Marklein died on 21 March 2012 at Spring Green, Sauk, Wisconsin, at age 83 Florence E. Schmitz, age 83, of Richland Center and formerly of Bear Valley, passed away on Wednesday, March 21, 2012, at Greenway Manor Nursing Home in Spring Green. Florence was born on June 23, 1928, the daughter of Herman and Erna (Willey) Marklein of Plain. She met her husband, Francis Schmitz at a dance. They were married on Oct. 12, 1948, and spent 55 years working hard together at the Schmitz Bear Valley Cheese Factory. After their retirement in 1987, they moved to Richland Center. Together they raised four sons and a daughter, Gerry (Alice) of Hawthorn Woods, Ill., Kathy (Wayne) Morgenthaler of Richland Center, Peter (Cindy) of Sun Prairie, Tom (April) of Spring Green and Dale (Mary) of Naperville, Ill; 10 grandchildren and a great-great-granddaughter; a sister, Imelda (Don) Lins of Prairie du Sac, two sisters-in-law, Rita Marklein and Anne Marie Ring both of Spring Green; two brothers-in-law, Joseph (Catherine) Schmitz and Erwin (Lindy) Schmitz both of Bear Valley; several nieces and nephews; and other relatives and friends. She was preceded in death by her parents; her husband, Francis; four brothers, Ray, Vincent, Larry and Lloyd; and two sisters, Viola Marklein and Laura Moran. Florence was known for her love of family, her deep faith, wonderful home-made bread and delicious "shipwreck". She had a great sense of humor, quick smile and enjoyed cross-stitching, crocheting and spending time in her huge beautiful rock garden. She endured over 15 years from a stroke with great dignity and strength without complaint. She gave her children good values and strong work ethics which are now her grandchildren’s. A Mass of Christian Burial will be held on Saturday, March 24, 2012, at ST. MARY'S CATHOLIC CHURCH in Richland Center at 11 a.m. Father Roger Scheckel will officiate with burial in the St. Kilian’s Catholic Cemetery in Bear Valley at 2 p.m. Visitation will be held on Friday, March 23, 2012, at the STAFFORD FUNERAL HOME in Richland Center from 4 p.m. until 7 p.m. where a scripture service will be held at 3:30 p.m. Visitation will also be held on Saturday at the church from 10 a.m. until the time of Mass at 11 a.m. A special thanks to Dr. Tom Richardson and the staff at Greenway Manor for their tender and loving care of Mom over the last seven years. Wisconsin State Journa, March 23, 2012. Peter Schmitz married Cecila Goeker, daughter of Stephen Goeker and Kate (?). Peter Schmitz was born on 18 November 1812. He died on 25 April 1873 at age 60. Name Variation Cecila Goeker was also known as Goeser. Name Variation Cecila Goeker was also known as Goese. Cecila Goeker married Peter Schmitz. Cecila Goeker was born on 4 October 1825. She was the daughter of Stephen Goeker and Kate (?). Cecila Goeker died on 27 March 1886 at age 60. Stephen Goeker married Kate (?). Married Name Her married name was Goeker. Kate (?) married Stephen Goeker. Anthony Schmitz was born in 1852. Anthony Schmitz married Catherine Greenheck, daughter of Hubert Greenheck and Agnes Roschen, on 17 January 1887. Anthony Schmitz died in 1935. Name Variation Catherine Greenheck was also known as Gruneck. Married Name 17 January 1887 As of 17 January 1887,her married name was Schmitz. Catherine Greenheck was born in 1860. Catherine Greenheck married Anthony Schmitz, son of Peter Schmitz and Cecila Goeker, on 17 January 1887. Catherine Greenheck died in 1920. Bernard L. Schmitz was born on 18 May 1889. He was the son of Joseph Schmitz and Gertrude Ann Dederich. Bernard L. Schmitz died on 14 September 1918 at age 29. Hubert Peter Schmitz married Clara Gertrude Klein. Hubert Peter Schmitz was born on 1 July 1888. He was the son of Anthony Schmitz and Catherine Greenheck. Hubert Peter Schmitz died on 14 September 1963 at age 75. Clara Gertrude Klein married Hubert Peter Schmitz, son of Anthony Schmitz and Catherine Greenheck. James Alan Schmitz died in 1966. John B. Schmitz was born in 1846. John B. Schmitz married Mary Schauf on 8 February 1887. John B. Schmitz died in 1915. Married Name 8 February 1887 As of 8 February 1887,her married name was Schmitz. Mary Schauf married John B. Schmitz, son of Peter Schmitz and Cecila Goeker, on 8 February 1887. Kenneth P. Schmitz was born on 20 February 1924. He was the son of Hubert Peter Schmitz and Clara Gertrude Klein. Kenneth P. Schmitz married Wynema Zajicek, daughter of Frank Zajicek and Josephine Farrington, on 5 June 1947. Kenneth P. Schmitz died on 9 January 2003 at age 78. 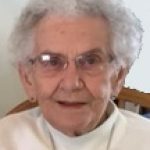 Wynema Zajicek died on 3 June 2014 at age 92 Wynema “Sue” Schmitz age 92 of Bear Valley passed away on Tuesday, June 3, 2014 at the Greenway Manor Nursing Home in Spring Green 2 hours after her sister, Eileen Angle passed away. She was born on September 14, 1921 in Petersburg, WI the daughter of Frank and Josephine (Farrington) Zajicek. She was married on June 5, 1947 to Kenneth Schmitz. Sue enjoyed playing cards, camping, cooking, baking, going out to eat, the outdoors, gardening and never complained. Her favorite saying was, “that’s the way the ball bounces”. She adored her grandchildren and great grandchildren. Survivors include, a son, Bert Schmitz of Lone Rock, 3 grandchildren, Vicki (Bruce) Hying of Dodgeville, Jean Schmitz and special friend, Kial Silvers of Richland Center, Kevin (Bethany) Schmitz of Bear Valley, 3 great grandchildren, a brother, Paul, nieces, nephews, other relatives and friends. She was preceded in death by her parents, Frank and Josephine Zajicek, her husband, Kenneth, a son, Joseph, a daughter-in-law, Mary Schmitz, 2 brothers, Galen and Jim Zajicek, 2 sisters, Renora Bremmer and Eileen Angle. A Mass of Christian Burial will be held jointly with her sister, Eileen Angle on Tuesday, June 10, 2014 at 11:00 A.M. at St. Luke’s Catholic Church in Plain. Fr. Mike Resop will officiate with burial in the St. Kilian’s Catholic Cemetery in Bear Valley at 2:00 P.M. Visitation for Sue will be held on Monday, June 9, 2014 at the Richardson-Stafford Funeral Home in Spring Green from 4:00 P.M.-8:00 P.M. and at the church on Tuesday from 9:30 A.M. until the time of Mass. In lieu of flowers memorials may be made to St. Luke’s Catholic Church, St. Kilian’s Catholic Church or Sacred Heart Catholic Church. Online condolences available at www.staffordfuneralhomes.com. The Richardson-Stafford Funeral Home is assisting the family with the arrangements. Joseph E. Schmitz was born in 1949. Joseph E. Schmitz died before 2014.